This is a 7 days trek that makes a circuit of the Helambu Region.The easiest starting point for this trek is Sundarijal due its proximity to Kathmandu. Helambu is the good trekking destination throughout October to May. This trek remains at reasonatly low elevations where, there is little chance of altitude problem but you should be prepared for cold and possible snowfall at Tharepati during the winter. 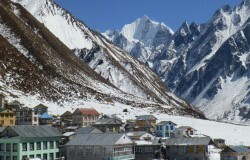 There are fewer trekkers here than in the Everest, Annnapurna or Langtang region and good lodges are abundant and uncrowded. The Helambu trek starts from Sundarijal,a small dam and hydroelectricity station in the northeast corner of the Kathmandu valley. Then the trail climbs through wet, subtropical forest to an oak forest and on to Mulkharka, a scattered Tamang village, the trail again ascends through oak forest to a pass calledBurlung Bhanjyang. After Sivapuri ridge the trail descends to a flat area known as Chisapani for an overnight stop. The trail continues to drop from Chisapani on a good, sometimes level trail that crosses meadows and field. 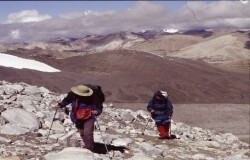 Patibhanjyanj is on a saddle at the bottom of the ridge at 1770m. then the trail heads north out ofPatibhanjyang along the forested ridge and then descends to a large Chorten, the Tmang village of Gul Bhanjyanj to another pass at2620m. This is a spot from where one can see Gulbhanjhyang clearly.The trail then descends to Kutumasang at 2470m for an overnight stop. 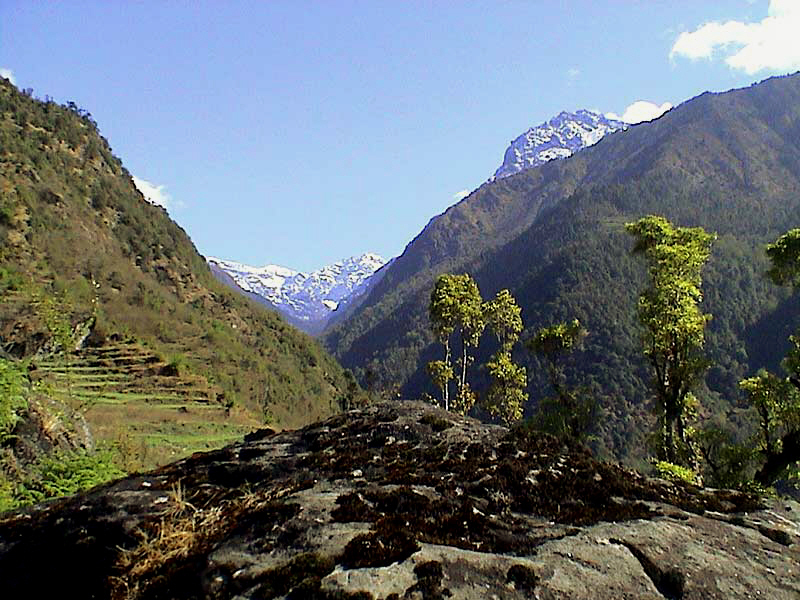 The trail climbs above Kutumasang on a steep, eroded trail, mostly through fir and rhododendron forest where there are no permanent settlement. Then the trail descends to Magen Goth (3150m). It finally reaches Tharepati for an overnight stay. From Melamchigaon the trail continues its descent to the Melamchi Khola. After crossing the suspension bridge the trail begins climbing up the other side of the valley towards Tarkeghyang. It is a long climb to this picturesque village at 2600m. Situated on a shelf high above the river.Tarkeghyang is the largest village in Helambu and the destination for the most trekkers in this region. It is a good place to take a rest. From Tarkeghyang the trail makes a sweep around the head of the wide valley between Parachin and the pretty village of Gabgjwal at around 2500m. The trail drops down from the edge of the ridge then continues at round the same altitude along the side of the ridge crossing a number of streams and waterfalls and a landslide. 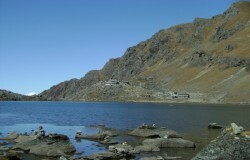 Finally, it passes a gompa and reaches the large Village of Sermathang (2620m) for an overnight stop. From Sermathang the trail follows the ridge all the way down to Melamchi, a drop of 1790m. After passing a large Gompa at the southern end of the village the trail undulates along the west side of the ridge passing Chorten after Chorten before dropping down toKakani. From Kakani the trail drops down to the small village ofDubochaur (1500m). From hear the trail continues to descent even more steeply down the ridge to the junction of the Indrawoti and Melamchi rivers. After crossing the suspension bridge over the Melamchi river you will reach Melamchi Bazaar. From here the transport including buses, runs frequently along the Helambu highway to Kathmandu. Drive back from Melamchi to Kathmandu by local bus which takes about 7 hours. Arrival and departure transportation, Kathmandu/Chisapani/ and Melamchi/Kathmandu by bus, 2 nights hotel accommodation in Kathmandu, in trekking food ( breakfast, lunch and dinner ) with accommodation , trekking permits, TIMS , guide, porters, their food, salary and insurance.